the intended usage scenario, e.g. indoor versus outdoor application. 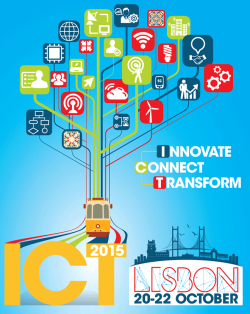 On October 20-22 2015 the Sunflower partners will present 3 organic photovoltaic demonstrators at the ICT 2015 conference in Lisbon, Portugal. We show organic solar cells seamlessly integrated into apartment windows and window blinds. As well as a handbag capable of charging electronic devices through integrated organic photovoltaics. These 3 demonstrators showcase the designer possibilities enabled by organic electronics. These products are the result of successful collaboration between European companies and universities. Nuremberg - for the German pavilion at the 2015 world exhibition in Milan, new ground is being broken with the integration of photovoltaics in architecture. This is the first major international architecture project in which the new products on the basis of organic photovoltaic technology (OPV) are being used. In contrast with conventional solar modules, the flexible film-integrated OPV modules from BELECTRIC OPV GmbH can be integrated in Schmidhuber's innovative architectural design without any problem. Nuremberg/Bretten, February 11, 2014 – Glass is a key construction material in modern architecture and shapes the appearance of our towns and cities considerably. For architects and designers, glass offers enormous potential thanks to its wide variety of properties and processing options. Therefore, the combination of glass with the most innovative type of photovoltaics, OPV (Organic Photovoltaics), will be trendsetting both architecturally and commercially. The result of the joint development project worked on by BGT Bischoff Glastechnik AG, the glass finishing specialists, and BELECTRIC OPV GmbH, pioneers in the field of organic photovoltaics, is now available on the market with the product ’BI-Powersol’.